This article is about the place called Yoshi's Island. For other uses, see Yoshi's Island. Yoshi's Island is where Yoshi was first discovered (and where his species appears to be native to), hence his name. 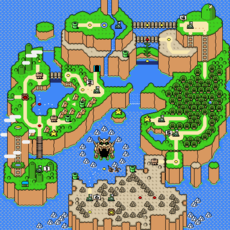 The island is part of a larger region called Dinosaur Land and first appeared in Super Mario World. 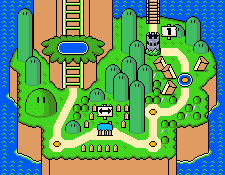 In Super Mario World, Yoshi's Island is the first world of the game, as well as where Yoshi is first met. It is located at the southwest portion of Dinosaur Land. Yoshi's House is located where Mario and Luigi begin their jouney, with the Yellow Switch Palace at the summit of Kappa Mountain to the northwest, and #1 Iggy's Castle to the northeast. After the castle is cleared, a bridge opens to the Donut Plains. The world is grassland-themed and can be re-accessed at any time in the game. Although the final world is World 6 (Koopa Kingdom), it technically is not present on Yoshi's Island, as the cutscene where Yoshi clears World 5 shows Yoshi teleporting to the final world. In Yoshi's Story, Baby Bowser took over the island in an attempt to capture the Super Happy Tree. Baby Bowser placed a spell over all the Yoshis, but six were unaffected (as well as two more later on), as they were unhatched and still in their eggs at the time the spell was cast. The six Yoshis battled their way to Baby Bowser while eating fruit and regained their island by defeating Baby Bowser and breaking the spell to get the island back. Eventually, the situation in the island returned back to normal with the Super Happy Tree left unstolen. Yoshi's Island in Yoshi's Topsy-Turvy. Similar to Yoshi's Story, in Yoshi Topsy-Turvy, the island was locked inside a pop-up book, this time known as the Forbidden Pop-Up Book. A spirit, named Hongo, felt threatened by Bowser and tried to lock him away in the book. The book was too powerful and sucked in all of Yoshi's Island, turning everything into paper and cardboard. Yoshi, assisted by the Yoshi Island Spirits, traversed the Island to reach Bowser. Upon defeating Bowser, Yoshi and Hongo returned the island to its normal state. Yoshi's Island as it appeared in Yoshi's Island DS. 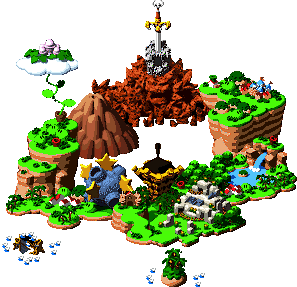 In Super Mario RPG: Legend of the Seven Stars, it goes by the name Yo’ster Isle, which is closer to the original Japanese name. It is an optional area of Mario World and can be easily bypassed by ignoring the Pipe Vault and moving on to Moleville. The island is the home to many Yoshis of various colors. Yoshis find entertainment in the Mushroom Derby, a short race on the island's track. The Yoshis of the island enjoy racing and hold the Derby often. The island is also a famous tourist destination; for many years, people from around the world have traveled to Yo’ster Isle to experience its many features. Yo’ster Isle is connected to the mainland by a Warp Pipe to Pipe Vault. The island is rich with vegetation and scattered with trees. No true buildings exist, yet small, open shelters made of wooden poles and covered with leafy roofs provide the Yoshis with protection from harsh weather. Most of the Yoshis can't actually speak directly to humans; only Yoshi can communicate with Mario, and acts as translator when talking to the other Yoshis. Besides Yoshi himself, there are several important Yoshis: Boshi, a blue Yoshi known for his antisocial behavior, and a small, green, Baby Yoshi that hatches and grows during the course of the game, though never leaves the small nest. If Mario feeds him enough cookies, he will eventually be rewarded with a few rare items, including Red Essence. Boshi was once considered the leader of the island after he won the Mushroom Derby and declared himself boss of the Yoshis. However, with the help of Mario and Yoshi, Boshi was defeated in another Mushroom Derby race and the Yoshis began to live freely again. Although the Yoshis make up the indigenous population, the island is considered a vacation hotspot and Raz and Raini, two Toads from the Mushroom Kingdom, spent their honeymoon there. According to the Super Mario RPG: Legend of the Seven Stars Player's Guide, Yo’ster Isle is a part of World 2: Pond to Pipes. 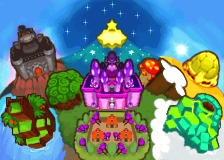 However, on the in-game map screen, the location is accessed as if it belongs to its own world connected to but distinct from World 2. The N64 stage, which also appeared in Melee. The Melee stage, which also appeared in Brawl and Super Smash Bros. for Wii U. The Brawl stage, which also appeared in Super Smash Bros. for Nintendo 3DS. There are three different stages that have appeared in the Super Smash Bros. series, which are all based upon, and entitled (though Super Smash Bros.'s version was renamed in Super Smash Bros. Ultimate), Yoshi's Island. They are all based off different games, however: the first is based off Yoshi's Story, the second off Super Mario World and the final one off Super Mario World 2: Yoshi's Island. Yoshi's Island in Mario Golf. Yoshi's Island is also one of the courses in Mario Golf for the Nintendo 64. It can have winds of up to 32 kilometers per hour and the occasional rain that slows down shots. It is mainly bumpy and has holes in which players need to shoot over the water to avoid an O.B. water hazard penalty. Constant Donkey Kong voices are part of the ambiance. The Nintendo 64 version also features fruits lining the tracks. This course was later re-created with the theme of Sparkling Waters in Mario Golf: World Tour under the same name. Baby Mario and Baby Luigi on Yoshi's Island in Mario & Luigi: Partners in Time. During the events of Mario & Luigi: Partners in Time, the island is attacked by Yoob and the Shroobs. After the first two Cobalt Shards are stolen by Baby Bowser, Mario, Luigi, Baby Mario and Baby Luigi visits the island from the time hole in the library on the second floor of Peach's Castle. They meet a reporter called Kylie Koopa and a giant, Yoshi-like monster called Yoob who attacks the town, as well as Baby Bowser and the young Kamek, who they chase after to the top of the mountain. This game portrays the island with unique enemies such as Pidgits who were only known to exist in Subcon and Coconutters who are a completely new species. There were Yoshi statues around the island, and one of them had a hole where the spring water was coming out. Baby Mario drinks this to become Pump Mario, allowing him to spit out water in short spurts. The young Kamek is initially seen collecting Yoshi Cookies for Baby Bowser, which adult Luigi also collects and feeds Baby Luigi several times in the rest of the game. As the four chase Baby Bowser and the young Kamek, they must use several techniques like Pump Mario and Spin Jump to make progress on the mountain. At the top of the mountain, as the adults ask Baby Bowser for the shards, the human babies eat up all the rest of Baby Bowser's cookies which causes Baby Bowser's anger and a fight. After defeating Kamek, the four chase Baby Bowser to a dead end, but before they have a chance to get the shard from the young Bowser, Yoob appears and eats all of the five characters. After Sunnycide in Yoob's Belly is defeated, Mario, Luigi, Baby Mario, Baby Luigi, Baby Bowser as well as Toadbert and the Yoshis Yoob has eaten escape from Yoob's digestive tract and land back on the island. The two Cobalt Shards come to life, hit Baby Bowser and fling him off the island, and come into the babies' possession. Yoob falls asleep on the mountain cliff and the player can return to his belly at any point. Toadbert decides to relax on the island until he is hit by Kylie Koopa later in the game. The music that plays in the village section of the island is a rendition of the title screen music from Super Mario World 2: Yoshi's Island. In Mario and the Incredible Rescue, Yoshi's Island once again appears, again by the name Yo’ster Isle. During the adventure, Mario, Luigi and Toad traveled to Yo’ster Isle looking for the next Mushroom. They end up getting attacked by Lakitu and Spinies, but Yoshi arrives and eats Lakitu's Cloud. As such, Mario can get the Mushroom and escape, allowing his party to advance to Moleville. Yoshi's Island in Itadaki Street DS. Yoshi's Island also appears as a playable game board in Itadaki Street DS and Fortune Street. In the Wii U version of Sonic Lost World, "Yoshi's Island Zone" appears as a DLC stage where Sonic must save Yoshis inside Yoshi eggs and bring them to the goal at the end of the level. 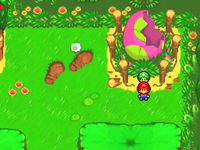 Many enemies and objects from Super Mario World 2: Yoshi's Island appear here such as Shy Guys, Piranha Plants, Warp Pipes, Flowers, and the final goal ring, while a new version of the Flower Garden theme is used as background music. This notwithstanding, the level's look is influenced by Yoshi's Story. Yoshi's bio on the official website of Super Mario Party mentions his island. In the first level of Yoshi's Crafted World, Rail-Yard Run, a box from a fictional brand of cookies named "Yo'ster Cookies," derived from Yoshi's Island's Japanese name, is used for part of a building, as shown in the level's flip side. "An island inhabited by members of the Yoshi race, a kaleidoscope assortment of friendly creatures. As a young snip, Mario had wild adventures here with his Yoshi friends." Mushroom Two are in the ? Block in the southeast of the scene to the west of the fourth scene in the second area. Super Mushroom Two are in the ? Block in the west of the cloud above the fifth scene in the third area. 1-Up Mushroom In the green block in the higher area of the fourth scene in the third area. 1-Up Super In the left green block on the cloud above the third scene in the second area. Green Shell Two are in the ? Block in the highest part of the fourth scene in the second area. Three are in the ? Block in the east of the third scene in the third area. Three are in the ? Block in the lower area of the fourth scene in the third area. Cannonballer Three are in the ? Block in the east of the cloud above the fifth scene in the third area. Smash Egg Two are in the right ? Block in the upper area inside the east house in the second scene in the first area. Two are in the ? Block in the northwest house in the second scene in the first area. Eight are in the right green block in the third scene in the second area. In the right red block on the cloud above the third scene in the second area. Two are in the ? Block in the west of the cave area of the scene to the west of the fourth scene in the second area. In the right ? Block on the cloud above the third scene in the third area. Three are in the ? Block in the center of the cloud above the fifth scene in the third area. Shroom Badge In the green block in the south house in the second scene in the first area. Heart Pants In the left green block in the northwest of the cloud above the south part of the scene to the east of the fourth scene in the second area. Bean To the left of the west house in the second scene in the first area. Between the west and the northwest houses in the second scene in the first area. To the left of the house in the fourth scene in the first area. In the southeast corner of the last scene in the first area. To the northwest of the pipe in the last scene in the first area. In the northeast corner of the cloud above the third scene in the second area. In the southwest corner of the cloud above the third scene in the second area. In the northwest corner of the cloud above the south part of the scene to the east of the fourth scene in the second area. In the southwest corner of the cloud above the south part of the scene to the east of the fourth scene in the second area. At the center of the cloud above the south part of the scene to the east of the fourth scene in the second area. In the northeast corner of the scene to the west of the fourth scene in the second area. In the south of the scene to the west of the fourth scene in the second area. In the southwest corner of the scene to the west of the fourth scene in the second area. In the northwest wall corner of the scene to the west of the fourth scene in the second area. In the southwest corner of the cloud above the third scene in the third area. In the northeast corner of the cloud above the third scene in the third area. In the northwest corner of the cloud above the fifth scene in the third area. In the south (a little to the west) of the cloud above the fifth scene in the third area. In the south (a little to the east) of the cloud above the fifth scene in the third area. ↑ As stated in the Super Mario World instruction manual p. 19. "Yoshi was first discovered on Yoshi's Island, that's how he got his name." ↑ Super Mario RPG: Legend of the Seven Stars Nintendo Player's Guide, page 24. ↑ GameXplain (December 18, 2013). Sonic Lost World - Yoshi's Island Zone Game & Watch (Video Preview). YouTube. Retrieved December 19, 2013. ↑ "Mario’s trusty steed from Yoshi’s Island. Has a very sticky tongue. "—Super Mario Party official website, Characters section. Retrieved September 30, 2018. This page was last edited on March 15, 2019, at 22:00.